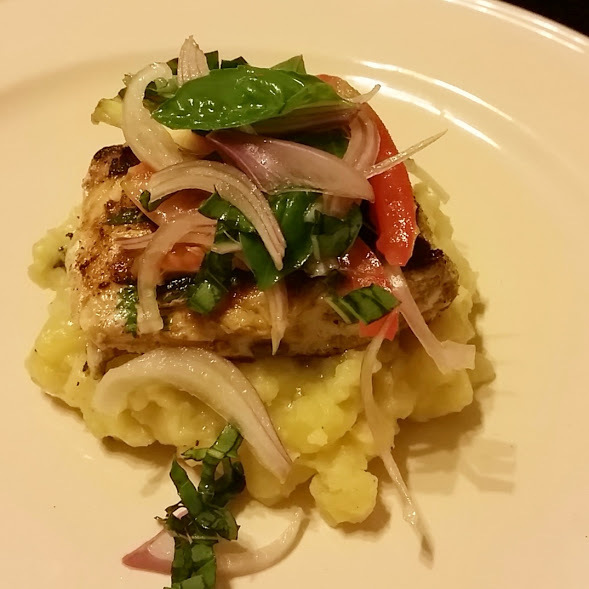 A simple, grilled fish on a bed of mashed potatoes and topped off with a fresh tomato and basil salad. This dish is everything: simple, warm and comforting from the potatoes and refreshing from the quick salad. The beautiful plating is perfect for simple home dinners, when you’ve had a long day and need something to cheer you up and impressive enough for those formal dinners hosted at home; a-la Masterchef style! Combine all the ingredients in a bowl. Drizzle over with some olive oil and set aside for use on the dish. This salad can also be made ahead; just combine all ingredients, except for the lemon juice and olive oil, and keep refrigerated. You may also use yellow/ red cherry tomatoes (halved) for this salad, and combined with a dash of balsamic vinegar. For the perfect mashed potatoes, I adapted the recipe from Natasha’s Kitchen. I added about a handful of grated mozzarella cheese and 2 teaspoons of dried oregano to top it off. Perfect! I wanted the fish to have a hit of heat to it, to balance the tangy salad and rich mashed potatoes. You can use any type of firm fish: tilapia, mullet, tuna, cod or even king fish. In a bowl, combine all the ingredients for the marinade and apply to the fish in a flat pan. Ensure the fish is well coated on both sides with the marinade. Leave in the refrigerator for about 2 hours. In a grill pan, add 2 knobs of butter, or if you prefer some olive oil, and evenly grill the fish on both sides, until cooked through. On a plate, place a good sized portion of mashed potatoes in the middle, place one of the grilled fish fillets over the potatoes and top off with the fresh tomato-basil salad and serve!